It’s a Monday night at Delicious Orchards, and kids are busy finishing rolling out the fettuccine noodles and setting the tables. The marinara sauce is simmering on the stove and the aroma of apple crisp escapes from the oven. The kids sit down around the picnic table outside for their own pasta dinner before the guests arrive, and a representative from the organization being supported at the dinner talks to the group about what his/her organization does in the community. After the kids have dinner, guests begin to arrive. The young cashier takes money at the door and the young maitre d’ escorts guests to their tables. The waiters approach with bread and greetings and takes orders. There is a lot of conversation at the shared tables, neighbors catching up, interrupted only by kids serving salad, pasta and dessert. You know how when you go out to lunch with a friend and both of you are trying to pay the bill? One person might end up paying the bill and allow the other to pay the tip–which becomes inevitably generous–and then the other tries to make up for the generosity by doing something else. And the cycle continues. 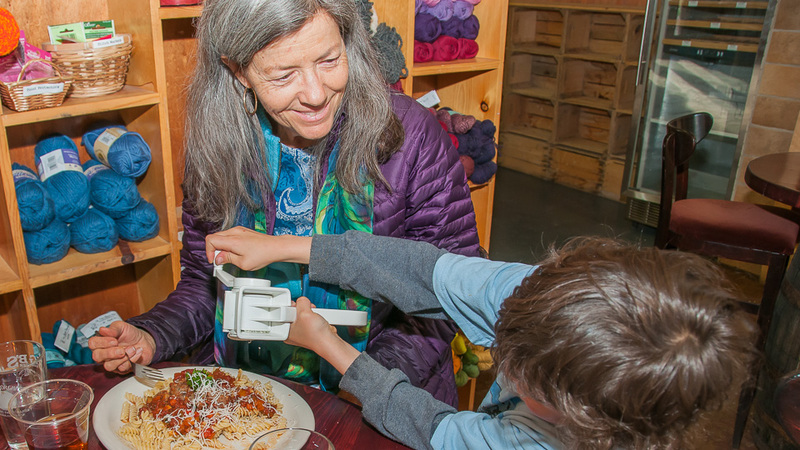 That’s how it has been for Kids’ Pasta Project in the North Fork community since April 2009, when the kids first started serving home made pasta dinners to the public and donating profits to local causes at Eleni’s Uptown. The generosity began with Eleni offering her restaurant for us to use. We are basically helping other organizations that help our community; so we donate money to the organizations and the organizations use it to put back into the community. The North Fork community also supports the Kids’ Pasta Project in many ways, and thus the circle of giving continues. Community organizations, businesses and individuals of all ages support KPP by partnering to host dinners, attending dinners, donating goods and money and volunteering at the dinners. Sometimes the best support is the kind that’s hard to define, like when a dinner guest offers a waitress words of encouragement or a farm calls unexpectedly offering bunches of basil. Antonio said that about our community in a 2010 video that Hutman Media donated its services to make, one of the many generous gestures that became infectious then and continues to this day. In that video, we discuss how much the community plays a part in KPP and how mutually beneficial it can be. As the kids are learning the value of service to community, they/we also get to witness how much community organizations and individuals do for each other and for KPP. The organizations (KPP Partner-Recipients), local businesses and farms, guests and volunteers represent different segments of this synergistic community! Originally, KPP was just a good idea for helping kids learn practical business and restaurant skills while raising money for their school. Aki, Jo E., Jo F. and I were working together to set up the dinner operations, and other founding board members, Daniel, Elaine and Jim helped set up the organization and complete essential behind-the-scenes work. After a few practice dinners with friends and their kids, we decided that we should play restaurant with our friends and let them enjoy the smiling service that only seven- to twelve-year-olds can bring. Soon before the dinner, Aki’s mother-in-law, Liz, suggested that we donate the profits from our first dinner to the Senior Center because she volunteered there and could see that it needed funding. Her suggestion proved to be the most brilliant stroke in the whole process of beginning–it was the idea that nudged KPP’s direction firmly into the realm of community service along with practical education. It wasn’t hard to find other organizations that needed funds, and soon our Monday night dinner schedule was full of organizations being sponsored. Soon, these “recipient” organizations became officially called “Partner-Recipients” because they were partnering with us to enhance the dinners and invite their friends and memberships as well as receiving the dinner profits. Sixty organizations partnered with KPP between 2009 and 2014, some every year, some just once and others in between for a total of 143 dinners. How is your organization strengthening our community? In what ways does your organization work to empower individuals to serve their community? How does your organization serve to build bridges between different people and groups in the community? KPP Volunteers are invited to participate in choosing the organization that will receive the award, which is presented at the KPP dinner on Martin Luther King, Jr. National Day of Service. The award recipients—Paonia Library, Pickin’ in the Park, Helping Hands and Tri-County Resources–reflect the wide range of organizations that serve our community, offering education, music, food for the community, those in need, and provide support to counter domestic violence. The KPP volunteers who review the applications learn a lot through reading about what they do and discussing who should receive the award. KPP didn’t ask Hardins to donate 50 pound sacks of organic flour whenever we needed it; Scott and Lisa just offered sometime very soon after we started and have continued ever since! Likewise, KPP didn’t ask Flying Fork Bakery to charge only cost for providing bread for the dinners; Kelly just said he wanted to support what we were doing. When Mesa Winds called to say they had thirty boxes of the most delicious peaches in the world to offer for our desserts, all we had to do was pick them up. Orchard Valley not only had cases of wine to donate, which added to dinner profits, they also had world class vinegar to sell to us at cost so that our salad dressing could be delicious with simply oil and that vinegar. North Fork Lifestyles regularly offered door prizes, something that adds greatly to the after-dinner presentations that the kids do. Zephyros Farm, one of the early KPP providers was ready with a deal on lettuce any time they had it. Ultra Mat left a message one day saying they wanted to do KPPs laundry, so wash the light blue tee-shirts made at Lasting Impressions with money donated by Cocker Kids’ Foundation and the aprons handmade by Jo and Aki. The kids involved in The Sauce Plot gave it that name one of the mornings they gathered at the yurt on the farm to learn about the work they would be doing in the gardens. 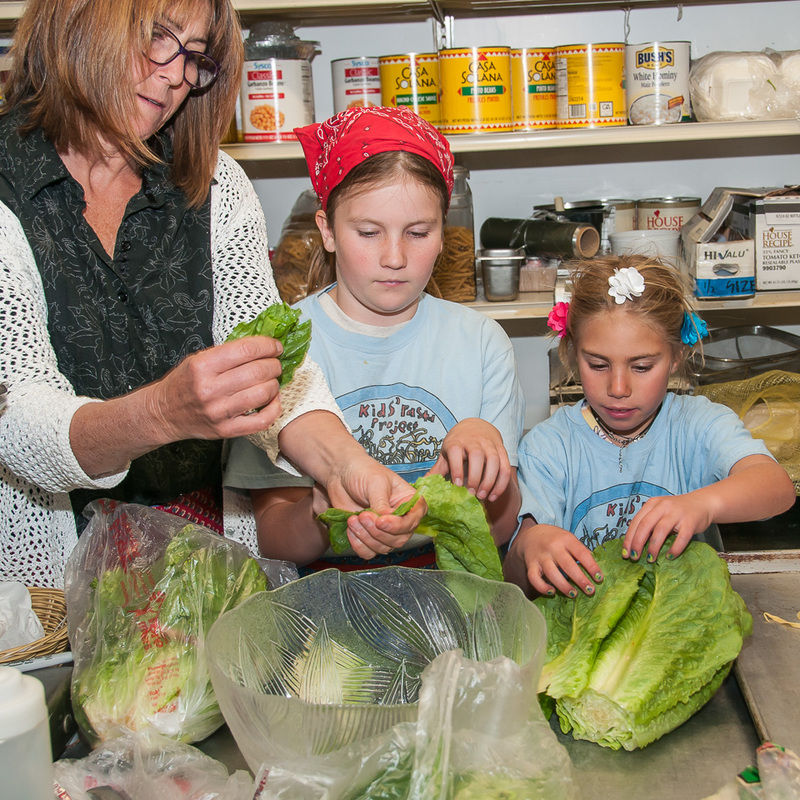 Anna Kampe and her assistant, Lizzie, guided the kids in all aspects of growing produce for the KPP dinners as Mark Waltermire, owner and master farmer at Thistle Whistle offered frequent expert advice and mini-lessons. Thistle Whistle Farm has designated a portion of the farm as “The Sauce Plot” ever since. Beginning with Eleni’s, several restaurants have welcomed KPP to use their space on Monday nights when possible. Fresh and Wyld offered their beautiful setting for a transitional time between Eleni’s and Scenic Mesa Ranch, while Julie Littlefield generously offered the use of the restaurant and the deck’s gorgeous views from fall of 2010 through spring of 2013. After that, PJ’s in downtown Hotchkiss made it easy for the crew to step into Peter’s charming space to work. When PJ’s started opening on Mondays, Delicious Orchards, which had been a venue for KPP special events in the past, stepped in to offer their space with a nice blend of outdoor and indoor seating. 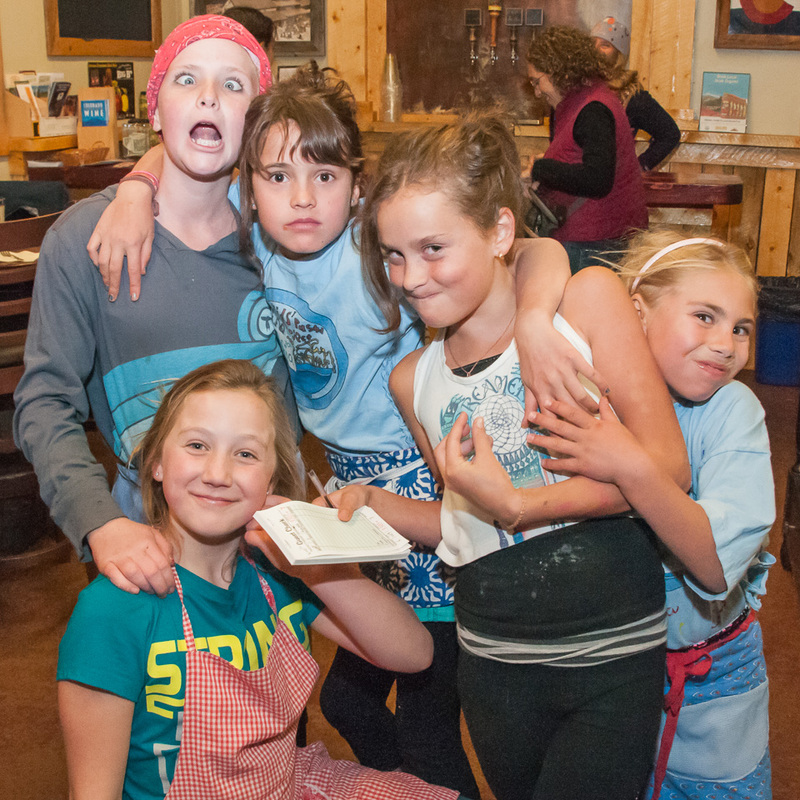 The Paonia Teen Center, Hotchkiss Memorial Hall, Orchard Valley, The Blue Sage, Crawford Town Hall and recently, the North Fork Community Montessori School in Crawford have all been welcoming venues for KPP dinners and other events. Other events have included serving at the BMW Rally and Ride the Rockies, catering a rehearsal dinner, marching in the parade, having a recipe development class for some of the kids, training programs, Bulldog after-school learning center activities, school visits to teach pasta making, library programs and displays at Mountain Harvest Festival. 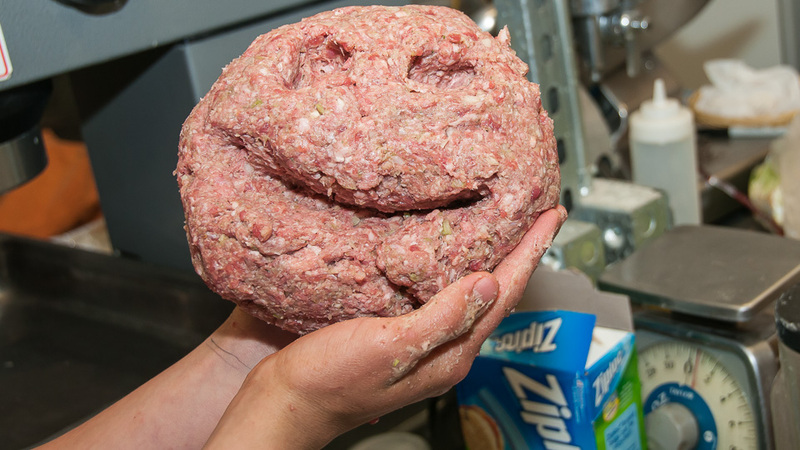 Kids’ Pasta Project would not exist without the kids who make it happen. At every dinner, a crew of eight to twelve seven- to sixteen-year-olds mound flour and mix in eggs and olive oil to make fresh pasta dough, and then roll it through pasta machines to make the fettuccine noodles. They prepare the salad and dessert, set the tables and make sure that everything is ready for the dinner guests to arrive at 6:00. Volunteers wait on tables and work the “front of the house” as cashiers, hosts and hostesses. The waitresses and waiters are generally paired with a less experienced volunteer who helps bus the tables. There is a bustle throughout the dinner; kids are grinding pepper and parm over chunky marinara, filling water glasses, bringing plates, clearing plates and having fun! 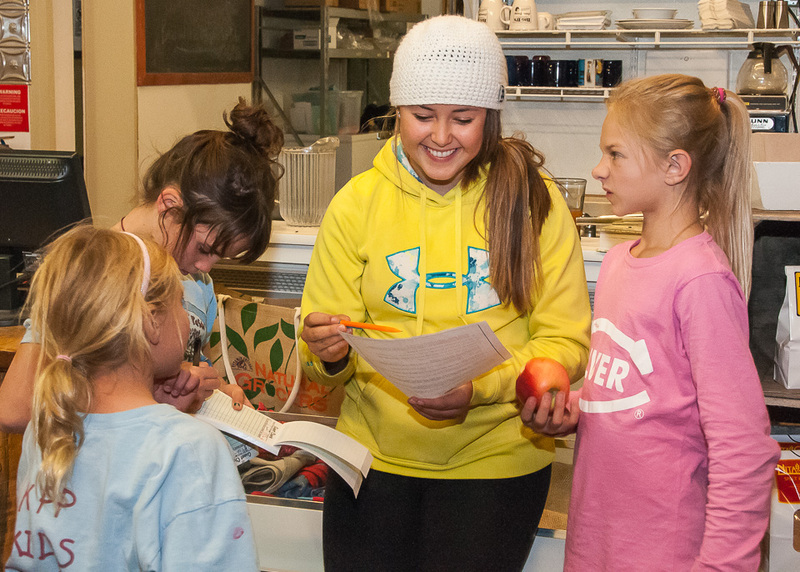 The youth volunteers–the KPP kids–learn the value of giving as they serve very welcoming and understanding crowds of dinner guests. A teen volunteer works as a “midway” between the kitchen and the dining area to make sure that orders get to the chefs and to the guests in a timely manner. On the other side of the line, another teenager makes sure that the bread, salads and desserts are in order. These teenagers are a part of the developing KPP internship program whose aim it is to help older volunteers learn management skills. As more experienced youth volunteers have the opportunity to learn skills to manage operations through internships, they also help to make the organization sustainable. In turn, they can learn to teach their skills to other volunteers, keeping the cycle of sustainability strong! In 2009, the average age of the youth volunteers was eight-and-a-half. Because some of those kids are still involved, the average age has risen to almost twelve. At the beginning, Jo F. gave me instructions about waiting tables and manners. My mom (Moni) gave me advice about how to take initiative. Aki taught me how to make apple crisp and Jo E. taught me how to make a spreadsheet. Hours and hours of doing all of these things helped me be able to teach other kids now. I organize and help kids do work journals at the end of the dinners. I can sit and have funny conversations or sing weird songs while I teach some of the other volunteers the apple crisp recipe and I can go home at the end of the night feeling happy! The teen volunteers also help organize the public speaking at the end of the dinner. Some of the youth volunteers get up in front of the crowd and ding a glass to get everyone’s attention. They give little speeches thanking our hosts and donors, telling about local food sources for the dinner and awarding a check with the dinner profits to a representative from the Partner-Recipient organization. Over 126 North Fork youth between the ages of seven and seventeen have served as KPP volunteers since the organization began in 2009. Some have been regular volunteers, working at least once a month, and others just come to support a certain organization, as is often the case with school groups such as the Paonia track team, the North Fork Community Montessori School, the K-8 Destination Imagination team and Flight of the Eagle Project. 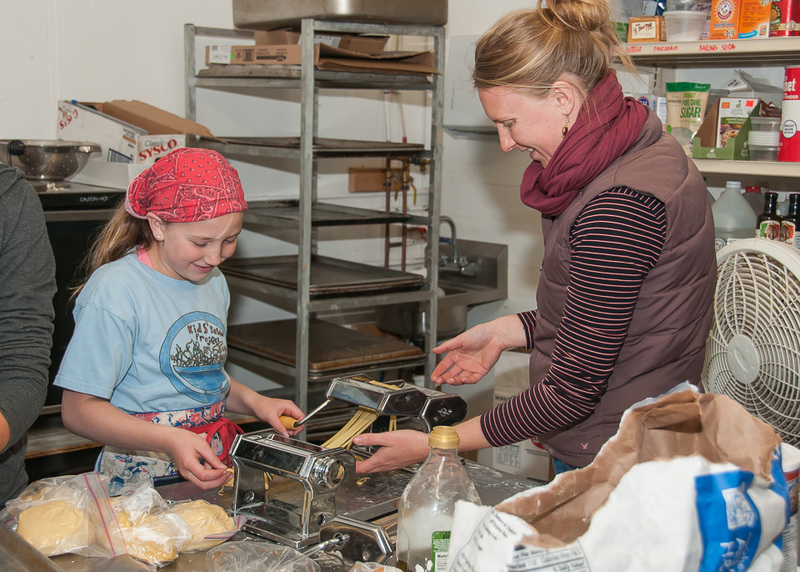 Youth ages 7-18 are welcome to volunteer for Kids’ Pasta Project. Applications are accepted at any time, and volunteers are scheduled when there are openings. Training orientations are also held for new volunteers. 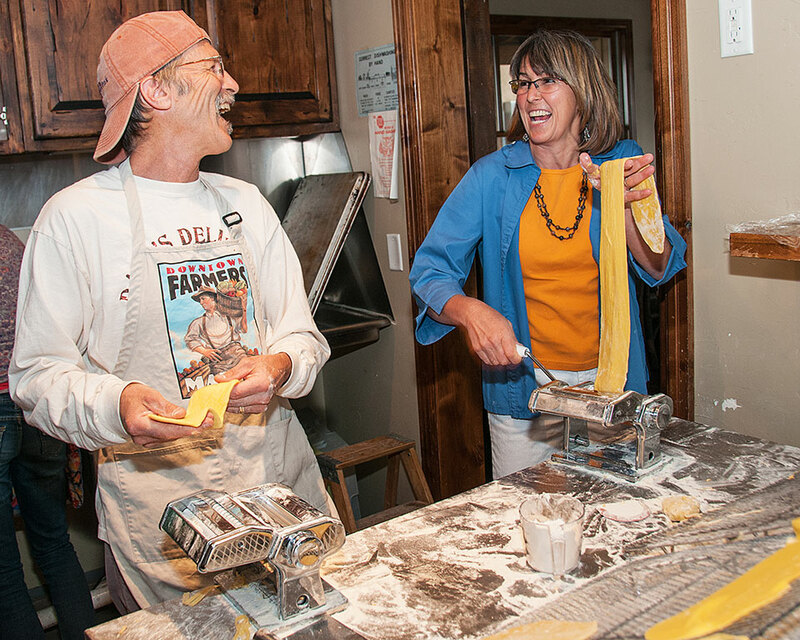 KPP is partnering with the Blue Sage Center for the Arts to offer a KPP summer camp focused on experimenting with pasta recipes and exploring the world of pasta from June 29 – July 3. Without the kind, supportive guests, the dinners would not be the same. I remember one of my first times serving a table. Earlier that day, I had asked Jo (Feldman) if I could wait on the big ten-top. She instructed me on how to set the table and what to say and do. I was very excited. Around 6:00 guests started arriving and I noticed people were starting to shuffle in and sit at my table. I repeated what Jo told me earlier over and over in my head until I walked over and said, “Hi, my name is Siena and I’ll be your waitress tonight.” The smiles the guests had on their faces encouraged me to smile back and be even more excited to wait on such nice people. Compliments the guests give at the end of the night and sometimes even thank you cards in the mail encourage us to keep going! KPP’s home base, where most of the dinners are served, is Delicious Orchards, just west of Paonia. Special dinners are also held at the Blue Sage, the Teen Center, Hotchkiss Memorial Hall, Crawford Town Hall and the North Fork Community Montessori School. For more information, please visit the newly-designed website, kidspastaproject.org. 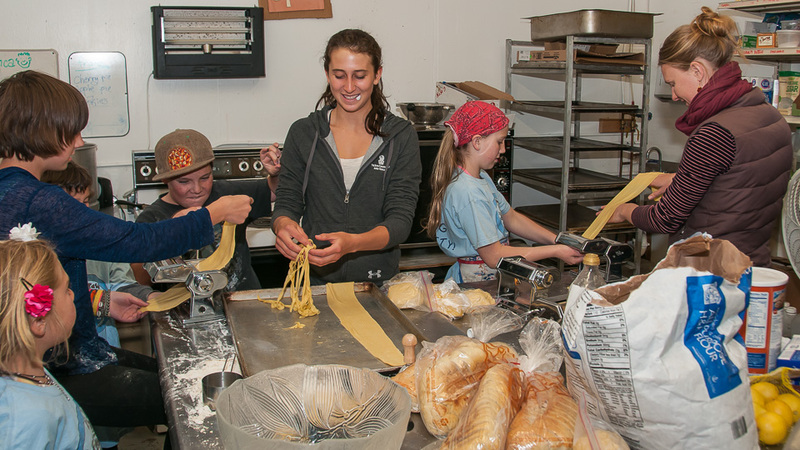 The mission of the Kids’ Pasta Project is for youth to serve their local community by preparing and selling freshly-made, healthy meals, with the profit going to local causes.